Lorenzo Pasqualis, the Blog: Tricks of Perception: Weight of Air. Tricks of Perception: Weight of Air. Sometimes perception tricks you in believing something that turns out surprisingly erroneous. For example, how heavy is air? Well, it is heavier than you would ever think! The Eiffel Tower that dominates the skyline of Paris is all made out of iron and weights around 10,000 tons (or 20,000,000 pounds). If you took the tower and placed it in an air cylinder, the weight of the air in the cylinder would be heavier than the tower itself! For the geeks: this can be easily calculated knowing a few facts. The Eiffel tower is ~1063 feet high and sits on a square of ~410 feet side. The weight of air is ~0.0805320691 lb/feet^3. 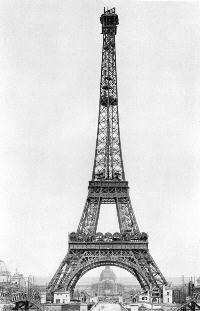 A cylinder enclosing the Eiffer Tower would contain 278,919,465 feet^3 of air with a total weight of 22,461,962 lb. Another example is the weight of the air inside a basketball. About 1/3 oz.